Researchers have mapped all 302 neurons that make up the C. elegans nervous system. However, until now, they had never observed action potentials in these cells. Image by Qiang Liu. Contrary to popular belief, the brain is not a computer. However brains do, in their own way, compute. They integrate informational inputs to generate outputs, including behaviors, thoughts, and feelings. To process vast amounts of data, the brain uses a kind of digital code. Its cells produce discrete bursts of electric current, known as action potentials, that function as the zeros and ones of the nervous system. This code is assumed to be a vital aspect of computation in animals—that is, in most animals. The tiny roundworm C. elegans has long been considered a curious exception; until now, action potentials had never been observed in the organism. 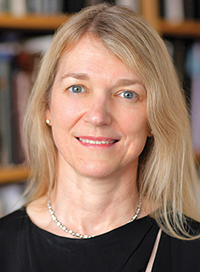 But in a recent study, Rockefeller scientist Cori Bargmann and her colleagues, Qiang Liu, Phil Kidd, and May Dobosiewicz, discovered, among other things, a C. elegans olfactory neuron that produces action potentials. The finding, published in Cell, overturns decades of dogma and could help scientists understand fundamental principles of brain computation. Neurons communicate with one another by exchanging chemical messages. Each message alters the state of the receiving cell; and as a neuron collects more and more chemical input, it approaches a threshold of activation. An action potential occurs when the cell reaches this threshold, at which point the neuron is said to “fire” or “spike” as an electrical impulse ripples through its extremity. In producing this spike, the cell translates analog chemical messages into digital electric code. Despite the apparent importance of action potentials, for years researchers believed that C. elegans and other nematodes simply didn’t use this information processing strategy. “There’s this whole class of animals where the neurons didn’t seem to spike,” says Bargmann, the Torsten N. Wiesel Professor. “So our question was: Well, what do these neurons do?” Seeking an answer, her team set out to measure the electrical behavior of C. elegans neurons—every single one of them, if necessary. “The C. elegans has just 302 neurons, so it’s one of the few animals where you can look at each individual neuron,” says Liu, a research assistant professor in Bargmann’s lab who set out to measure how all of these neurons respond to stimulation. Almost immediately, Liu was met with a surprise. While stimulating AWA, a neuron that processes smell signals, he observed that the cell’s electrical voltage rose very rapidly before dramatically plummeting. Though unexpected, this dynamic was also very familiar: it looked like an action potential. Additional experiments confirmed that AWA neurons indeed spike. The researchers suspect that other C. elegans cells also produce action potentials; yet they note that this is not the norm for this animal’s neurons. In fact, their experiments revealed that even AWA fires rather infrequently. Typically, the neuron responds to odors in a more subtle, graded manner. Liu observed action potentials only during experiments in which the stimulus grew stronger over time, suggesting that in nature, AWA fires when the animal is approaching the source of an important smell. While this study initiates C. elegans into the ranks of spike-producing animals, the action potentials observed in this organism were not identical to those seen elsewhere. 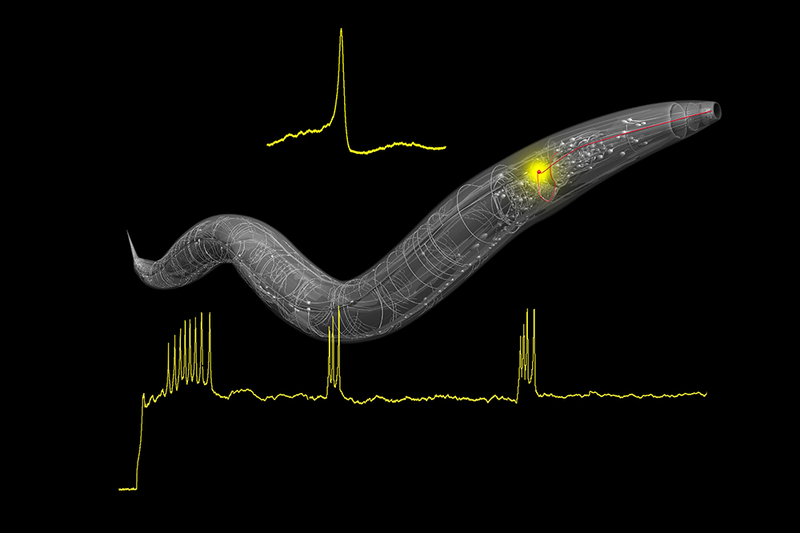 To define the characteristics of worm-specific spikes, postdoctoral associate Phil Kidd created a mathematical model of AWA’s electrical dynamics—a step that, the scientists hope, will allow their research to enter into conversation with other advances in computational neuroscience. This line of research indeed has the potential to both expand scientific understanding of C. elegans, and of nervous systems at large. A new study illuminates the biology that guides behavior across different stages of life in worms, and suggests how variations in specific neuromodulators in the developing nervous system may lead to occasional variations.